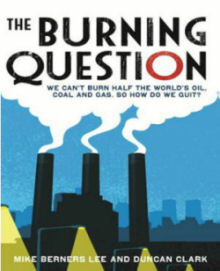 The Burning Question is this: how much oil, gas and coal can we safely burn without burning up the planet? Environmental scientist Mike Berners-Lee of Lancaster University has collaborated with Guardian journalist Duncan Clark to cut through the mountains of computer modelling, guesswork, jargon and misinformation, and provide a realistic answer. Which is? Well you’ll have to read the book, but in round terms, it’s not much, compared with the proven reserves. That’s the easy bit; the answer raises much more difficult questions. Do we have the willpower to leave all that carbon cash buried in the ground for the sake of future generations? If we have, can developed and developing societies withstand the shock of going low-carbon? Could we have growth in a low-carbon world? Is growth a necessary ingredient of human progress anyway? Is what’s good for us no longer good for our species? The Burning Question takes a dispassionate and ultimately optimistic look at all these issues. ‘Fascinating, important and highly recommended’. Al Gore.